No headers or column titles are allowed. 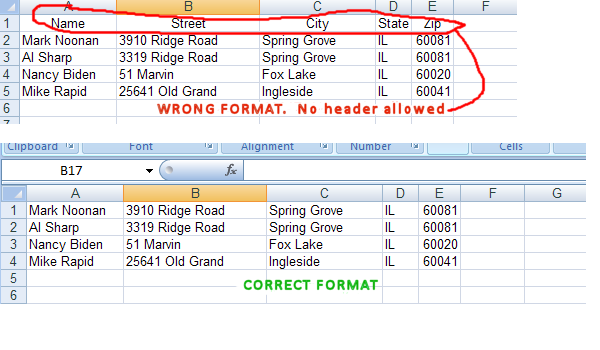 Using Option A, be sure to have 2 columns Name and Address. If you are using Option B, then be sure to have 5 distinct columns for Name(column A), Street(column B), City(column C), State(column D) and Zip(column E). Your first column must start at top left corner (cell A1). Do not put any header or column titles. Your sheet may not contain any other data or hidden columns. Please see second image below for a correct format. First image is wrong. Second image is a correct Excel sheet (Option B) that contains Name, Street, City, State and Zip fields and starts at top left. If you are still having issues, you can email us your Excel file and we might be able to help you. Please be sure to write TrackRoad.com in the email's Subject.